Using ModelBuilder to get Max and Min Values from raster to raster calculator? I'm building a model (ModelBuilder) at ArcMap 10.3.1. How can I get an output (can be a string) of the maximum and the minimum value of a raster to use it on raster calculator? My problem is that the Get Raster Properties does not export a string with the value. I would like to know if there is a tool or a way using ModelBuilder to extract to Max and Min value of a raster to directly apply on Raster Calculator. But it keeps exporting the number only in the results, and it does not convert into a string to use on raster calculator. Assuming the raster has already had statistics calculated, you can access the max and min values in the raster calculator directly using "your_raster".maximum and "your_raster".minimum syntax. See this answer for more details. There is no need to convert the output of the properties tool into a string. Not the answer you're looking for? Browse other questions tagged arcgis-desktop modelbuilder raster-calculator or ask your own question. Normalizing raster using raster calculator in ArcGIS 10.3.1? Using ArcGIS ModelBuilder to reclassify by raster properties (mean)? Using MAX in SQL Expression of ArcGIS ModelBuilder? Understanding min and max values with Mosaic to New Raster? 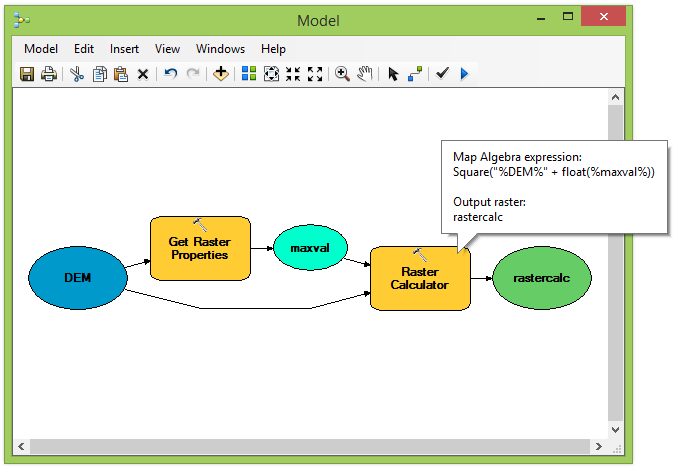 Raster Calculator Iteration in ModelBuilder? Using Cell Size in raster calculator (ModelBuilder)? Using ModelBuilder and Raster Calculator with Output Location? Getting max/min value from list of rasters in ModelBuilder? Using Raster calculator with ModelBuilder?